Hilary Grossman dated a guy so commitment-phobic that she was able to write a book about their relationship. She has an unhealthy addiction to denim and shoes. She loves to find humor in every day life. And she likens life to a game of dodge ball – she tries to keep many balls in the air before they smack her in the face. When she isn’t writing or blogging she is the CFO of a beverage alcohol importer. She lives on Long Island. 1.What got you into writing / what made you sit down and actually start something? I’ve been an avid reader my entire life and my life long dream was to write a book. In my early twenties I started writing, but I never stuck to any story long enough to finish one. About five years ago I read Jen Lancaster’s book Bitter Is The New Black and I discovered blogs and memoirs. Her book motivated me to stop dreaming and start writing. I began blogging days after I finished reading the book. Then two years later, I went to a BlogHer conference about turning blogs into a book. I was so motivated I started writing Dangled Carat that weekend. 2.What is a usual writing day like for you, how is it structured? I have the most non-author like day job…. I’m a CFO of a beverage alcohol company, and I work really long hours. I can’t stand to look at a computer after I come home, so I only write on the weekends. But I can sit for seven hours at a time typing away, lost in my story, with my cat by my side. 3.Do you get writers block? If so, how do you overcome it? Yes, of course I do. I overcome it by walking away, and making myself think about other things. When I clear my mind ideas come to me. I usually get my best ideas either in the shower or in traffic. 4.Are you a plotter or panster when it comes to writing a story? I’m a little bit of both. 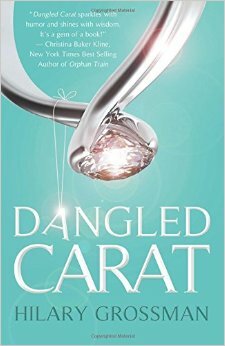 Dangled Carat is my real life chick lit story. Since I lived the tale I basically just wrote it as it happened. But with my upcoming novel, while I plotted the key points most of the subplots surprised me. I remember at one point typing out a conversation my main character was having and my mouth hung open when she expressed something serious that happened to her. I had no idea. 5.Are you traditionally or self-published, and what was the publishing process like for you? Any advice to aspiring authors? I started off being self-published. About a year later Booktrope (a hybrid publisher) republished my book. The publishing process was quite the journey. I began with the hopes of going the traditional route, and queried numerous agents. I had a lot of requests and positive feedback. In fact, one agent spent an hour on the phone with me going over ways she thought I could improve the book. I took all of her suggestions, but in the end I didn’t secure an agent. Eager to get my book “out there” I decided to publish myself. I loved self-publishing in the fact that I had total control over my book. But it is really hard doing everything yourself. When Booktrope contacted me I eagerly signed. I have a wonderful team and a spectacular book manager. I am no longer solely responsible for everything and I love it. My advice for aspiring authors is to develop a thick skin. The book industry is a very tough one. People are very critical and it is easy to get discouraged. Don’t let that happen. Believe in yourself and your book. There are so many ways right now to publish your book, take advantage of them, and take advantage of other authors. I am always blown away by how generous authors are with their time and knowledge. They are always eager to help. 6.What has been your highlight since becoming a published author? This is a tough question because there have been so many moments. One of the best moments was when I did a book signing and reading at Barnes and Noble – it was a total dream come true. But equally thrilling is when a reader contacts me to tell me that my story inspired them. 7.Can you share a little of your most recent book with us? And any other books of yours, if you wish. Dangled Carat is my true chick lit story about my attempt to convert a commitment phobic man into a doting husband with a lot of help from his family and friends. It is a humorous, lighthearted read – perfect for the beach – and features a cast of characters only real life could create. 8.What audience is your book targeted for, and what genre does it come under? Dangled Carat is a memoir that reads like chick it. It is targeted for woman twenty and older. It is the perfect book for anyone who has had dating drama and has wondered if she should love him or dump him. 9.Apart from writing, what do you do in your spare time? I am a total beach bum, so in the summer, that’s where you will find me. I also love to cook. And if all else fails, you can find me at the shoe store browsing (err I mean buying) another pair. 10.What tip would you give to new authors when trying to build a fan-base / get followers and market their books? (What to do and what not to do.) I am a total believer in the power of a blog. I met so many wonderful people and developed many friendships as a result of blogging. But in order to do so, you can’t be shy. The same goes for sites all social media sites. Comment often. Try to make conversations and build relationships. And above all else, always be yourself. 11.What is the hardest thing about writing? The hardest part about writing is that not all feedback will be positive. Not everyone will love your book, story, or characters. Some people will be down right mean and cruel while expressing their opinions. And it hurts. A lot. But when I feel bad I try to compare books to food. I enjoy really spicy dishes. Other people can’t eat any spice. Neither one of us are right, we are just different. Not everyone loves the same type of food, so how could everyone love the same book? Excellent interview. Hilary is one great writer, although I may be partial, since she is my daughter.